State regulators have ordered a company located in the Elsmere area in Delaware to install a compliant chemical storage unit. Last year, investigarotrs stated that the failure of a temperature controlled storage system led to the explosion that damaged a manufacturing site off of Maryland Avenue. The chemical that caused the explosion, diisopropyl peroxydicarbonate or IPP, knocked down concrete walls and buckled other man-made structures. The hazardous chemical is used as a catalyst in manufacturing specialty display filters and is very unstable at temperatures above freezing. A proper chemical storage room is needed for this chemical, officials stated. Department of Natural Resources and Environmental Control Secretary, Collin P. O’Mara, stated in a compliance order that the business had been using dry ice to manage the chemicals that were being stored. On June 29th, 1991, an explosion involving 150 pounds of diisopropyl peroxydicarbonate at the same site led to the evacuation of several nearby buildings. A hazardous chemical, such as diisopropyl peroxydicarbonate, should be stored in a chemical storage room that has temperature controls, alarms and a monitoring system for complete compliance. Providing you with superior protection, our SUPERLoc chemical storage units are designed to house flammables and combustible chemicals. Manage your chemical storage units within 10 feet or even inside your facility (according to state regulations) with the SUPERLoc chemical storage building by US Chemical Storage. 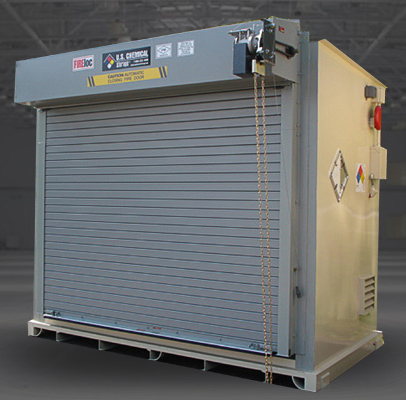 Our chemical storage units are built from extremely strong hand-welded steel for a durable and long lasting construction that you can rely on. Maintain your chemicals with a dependable chemical container and customizable accessories. Our engineers will provide you with the expertise you need to keep your chemicals completely compliant while following all EPA, OSHA and NFPA regulations. Our buildings are FM and Warnock Hersey Approved for increased safety. Keep your chemicals safe with our chemical storage units today!